I thought I was so clever when this title popped into my head. However, when I was linking the Pattycake site I discovered that me and the fabulous Sarah B., think alike. 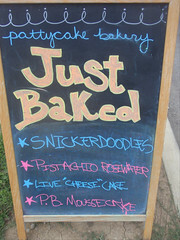 There is a lot going on at Pattycake Bakery. Make sure to keep reading until the (almost) end because I have saved the best for last. Starting with the outside, there is a new bike rack. Patrons are known to walk and bike to Pattycake so Jennie and company being who they are – made the bakery bike friendly. 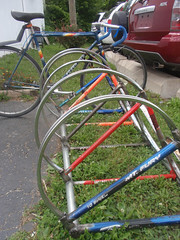 The bike rack is made out of old bike frames and used parts – how earth friendly is that. And cool to boot. Moving inside, Pattycake added a new oven in July then changed the layout of the counter and cooler giving the space a new fun feng shui. In regards to the oven, on moving day there were some snags with the delivery so a text message went out for volunteers to help and six able bodied souls showed to help. Again – a cool community. Columbus Alive and CMH G). 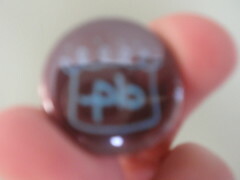 The counter also has a big bowl of free Pattycake Bakery (PB) buttons. New to the bill of fare – vegan soft serve (ice cream). 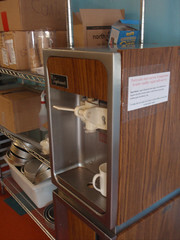 The mixing machine is in place with servings by the cone or cup. I have seen carnivorous kids flock in for this non dairy treat and leave quite pleased to be weaned from the bovine teet. 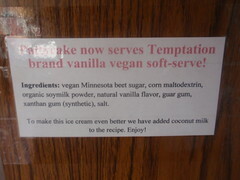 The fine print: Temptation Brand vanilla vegan soft serve - ingredients: vegan Minnesota beet sugar, corn maltodextrin, organic soymilk powder, natural vanilla flavor, guar gum, xanthan gum, salt. And PB adds.....coconut milk to make it better. 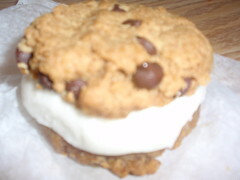 However, the penultimate addition involves Pattycake cookies and soft serve teamed together in sandwich form. The coldness of the combination slows down my rate of consumption but these are two great tastes that go great together. I look forward to the expansion of this line. There may be more new stuff down the road. See this Columbus Underground post that serves as an online focus group for a Pattycake powered vegetarian diner we may see someday. Even with all of this newness going on – all of the old things that make the bakery work well remain – good service, inventive menu, a focus on continuing to improve the product(s) and a laid back atmosphere. The only thing missing is vegan. Vegan has been dropped from the name but not the menu. The great thing about the cookies and cupcakes and cheesecakes…oh my (!) is that you would not know that they are vegan by tasting them – tasters have to be told. In the past vegetarian or vegan often conjured the taste of withered tofu and sawdust – not so here. This is vegan baking so good you would think they were baking with bacon. 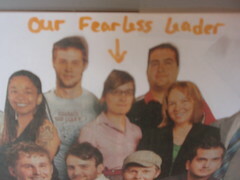 This entry was posted on July 28, 2009 at 11:19 PM	and is filed under bakery, Vegetarian Friendly. Tagged: Pattycake Bakery. You can follow any responses to this entry through the RSS 2.0 feed. You can leave a response, or trackback from your own site. CMH G… you are the BEST!! !